I have multiple pdfs organized in folders and subfolders. Is it possible to use PDF Text Replacer to replace or delete some text and then just save the result in the same folders and subfolders by replacing the original pdfs instead of a different output location? I want to make sure I can preserve the same location and structure of folders and subfolders. for %F in (D:\temp\*.pdf) do pdftr.exe -contentreplace "My Name=>Your Name""%F""out_%~nF.pdf"
for %F in (D:\temp\*.pdf) do pdftr.exe -searchandoverlaytext "My Name=>Your Name""%F""C:\test\%~nF.pdf"
for %F in (D:\temp\*.pdf) do pdftr.exe -skip "%F""C:\test\%~nF.pdf"
for /r D:\temp %F in (*.pdf) do pdftr.exe -oldtext "Old Text" -newtext "New Text""%F""C:\test\%~nF.pdf"
I would prefer the GUI version rather than the Command line but if I understand correctly the GUI version does not allow to batch edit and save in the same location? If so, I would probably buy the Command line then but could you please give me an example of command line to batch remove a vertically aligned text having exactly the same position P1 (9 1018 29 505) in multiple pdfs in a folder and the subsequent subfolders so that the files remains where they originally are? One more thing: is it possible to have multiple rules in the same command line? If not, could you please explain how I can build a bat file that would contain all the command lines for different rules so that they all run? >>I would prefer the GUI version rather than the Command line but if I understand correctly the GUI version does not allow to batch edit and save in the same location? Yes, the GUI version does not allow to batch edit and save in the same location. >>If so, I would probably buy the Command line then but could you please give me an example of command line to batch remove a vertically aligned text having exactly the same position P1 (9 1018 29 505) in multiple pdfs in a folder and the subsequent subfolders so that the files remains where they originally are? for /r D:\temp %F in (*.pdf) do pdftr.exe -contentreplace "Old Text=>" "%F" "C:\test\%~nF.pdf"
>>One more thing: is it possible to have multiple rules in the same command line? If not, could you please explain how I can build a bat file that would contain all the command lines for different rules so that they all run ? 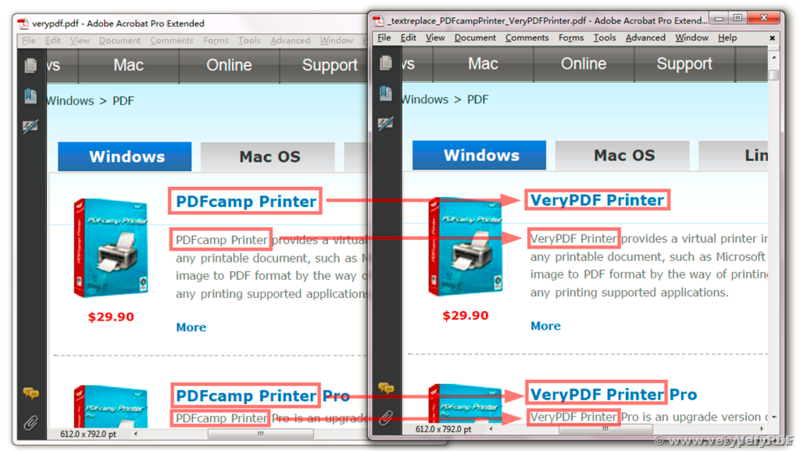 How to replace text in PDF by PDF Text Replacer correctly?